This is a very nice, bright and open Two Bedroom Two Bath Lakeview Emerald Bay Condo. Almost walk in level with just a few steps up from parking, directly across from one of the Outdoor Pools and Tennis/ Basketball court make this condo a great choice. The Master Lakeview Suite is appointed with a King Bed, the Guest Bedroom offers a Queen Bed and both Bedrooms have their own Cable Televisions. This Condo has a large Flat Screen Cable TV in the living room, WiFi throughout and the large screened in deck has plenty of space with two rattan loveseats, a gas grill and two High Top Tables with Chairs. The Emerald Bay Complex offers two outdoor swimming pools, a Tennis/Basketball Court and the Complex is located just minutes from many of the Lake Area attractions including Golf Courses, The Bagnell Dam Strip Area, Boat Rentals and The Osage Beach Premium Outlet Mall. 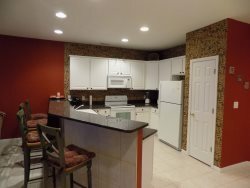 We also offer several other condos within this complex which are perfect for family reunions, company retreats, and other groups needing more than one condo. Book this condo with confidence and you will not be disappointed.